An interesting question arrived in my email a few days ago, "What is migraine advocacy? Is it just things like talking to Congress, or is there more to it?" What a great question Webster defines advocacy as, "the act or process of advocating or supporting a cause or proposal," and advocate as, "to support or argue for (a cause, policy, etc.)" We can participate in advocacy efforts in all of these areas at varying levels, depending on our health and capabilities. We can invest as much time as we want, and there are opportunities for participation that we can do at home by spending just a few minutes at our computers. Attending Migraine and headache advocacy events such as Headache on the Hill. Headache on the Hill is an annual event organized by the Alliance for Headache Disorders Advocacy (ADHA). Participants meet in Washington, D.C., learn about specific "asks" to discuss with their members of the House and Senate, then visit Capitol Hill to lobby on behalf of all migraine and headache patients. Emailing or calling our elected officials. Whether we email or call our Senators and members of the House on our own, or as part of an organized campaign, this is something powerful that takes only a few minutes, and can be done from home. Using social media, such as Facebook and Twitter, to share information and support. Sharing information on our Facebook pages often exposes people to information they might otherwise never see. Tweeting with the hashtag #migraine and retweeting good tweets from other people spreads good information exponentially. Wearing purple. Purple is the official awareness color for migraine and other headache disorders. When I wear a lot of purple, people tend to ask me, "What's with the purple?" Finding a knowledgeable, experienced doctor. Migraines aren't easy to treat, so we need to partner with a great doctor, one who will treat us as treatment partners, making decisions WITH us, not FOR us. Continuing to learn about migraine and our treatments. We can't call our doctor every time we have a migraine. That means we have to make treatment decisions ourselves when we get a migraine. Continuing to learn helps us be good treatment partners to work with our doctors. Requesting accommodations at work. Whether the problem is fluorescent lighting, a co-worker who wears fragrance, or other issues, we must sometimes advocate for ourselves at work. Dealing with insurance companies. Unfortunately, there are times when we have to advocate for ourselves with insurance companies to get the treatments we need. Coping with family members and friends who don't understand. It shouldn't happen, but it does - we sometimes lose friends and even alienate family members because they don't understand migraine disease and its impact. Most of the people who don't understand will be open to learning about migraine, which will lead them to a better understanding of why we often have to cancel social engagements and can't go some places because of migraine triggers. Sadly, there are those who don't want to learn, and we have to accept that they weren't good friend material in the first place. Once we start thinking about and participating in advocacy efforts, it doesn't take long for it to become automatic. People who are a bit shy may find that it takes a bit more effort at first. If that applies to you, just think of how much more difficult your life is because of migraine, the stigma attached to it, and the people in your life who don't understand. Think about how much easier life would be if everyone around you understood and supported you fully. We need everyone with migraine to help with advocacy efforts. Truly, we need people who don't have migraine to join us to form a strong voice in advocating for our needs. We must lead the way though. If we don't stand up and advocate for ourselves, we can't expect others to join us. 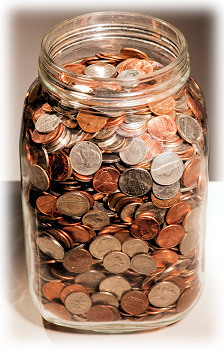 Here's something really great about advocacy efforts - they're like coins in a jar. Each little one adds up to something much larger.